Hey guys I just finished uploading my first tutorial onto youtube. It should be done processing and available in 720p now. The tutorial will teach you some of the techniques for creating your own custom cliffs and ramps. I also go over multi level water and a few other terraining tips. 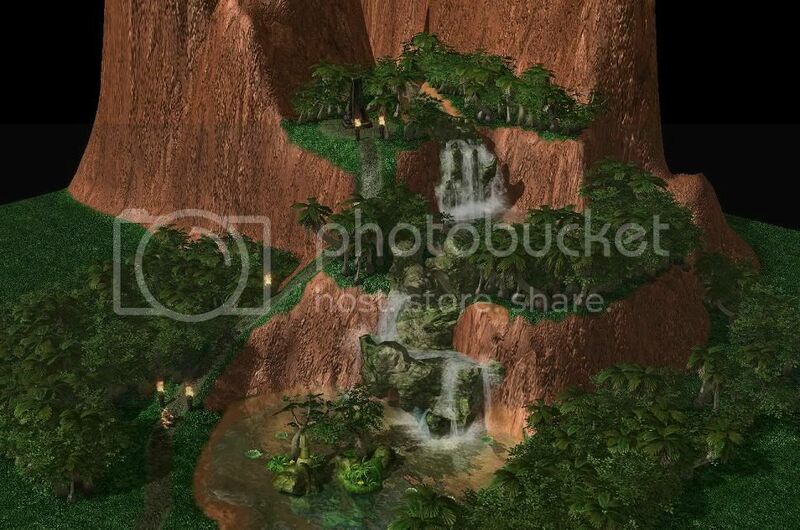 For an idea of what I am talking about take a look at the pic below from my "The Falls" map. Have fun and be sure to leave comments on how I can get better at doing tutorials. If i can add something to this tutorial. If you want to use the same water texture for both levels you could always just go to the Water Data type and make a duplicate of the water you are using. This will let you have the same water texture at different heights. Thank you for pointing that out. I had never even thought of that. Kudos Komodo :D .
Yes please do post a pic. If you have any problems or questions feel free to PM me or ask here. Have fun! I hope he runs with it because id love to try my hand at something similar. Ahh, so you are challenging me in my own turf?!?!?! :P Haha, thanks for the nice comments. I have a great idea cooking in my head right now. If I can pull it off it will be a great mountain indeed :P. Can't wait. Magnificent tutorial. It really shows to what extent you can use the "smoother" tool. I personally watched this video to see how you implemented water and even in the small volume you implemented, I was able to follow your mouse strokes and use your references in terms of tool size to enhance my personal map. Thanks for posting this. You are very welcome. I was worried that I was clicking to fast :P.
I would love to see some of yalls work :). Nice stuff, the only problem with doing cliffs this way is that I don't think Reaper cliff jump will work. Ohh, I am sure that someone can do things much better than me. Can't wait to see what people come up with :D .
While Looking good, this way of creating cliffs has a few other gamechanging problems... As you mentioned you have to add Pathing to it. Adding No ground Pathing to the Cliffs was no Problem at all. Then you have to make sure you can't build buildings on the edges of the cliffs or on the ramp as well since that could change the terrain to look ugly and unintended. Another problem is that despite looking Cliffy we terrain is still "flat". Which means units on the low side of the cliff can see units at the high side. So there is less tactical Bonus for positioning units there. Maybe you can workaround that with triggers bound to that region, I don't know. Are there any sort of sight blockers that can be used? I suppose the problem then would be getting it to work only one way (see down a cliff but not up). It's a shame you can't somehow do this terraining on top of cliff elements so they still have the normal behavior. Absolutely stunning bro. I figured this could be done though I had not attempted to do custom cliffs yet. I know how some of it is done, but about 25% that I didn't even think of or would have a hard time with out it being explained was very helpful. It looks awesome! Thnx for the info I needed to know! This is an excellent way to add variety and uniqueness to your maps... as others have pointed out it seems better suited for aesthetics strictly as opposed to functional cliffs. Not for nothing though, again... great way to make environments more authentic and unique. Good job. Yes it is mostly used for aesthetics. The editor is actually really limited in the terrain department. You only get two types of "cliffs", only 8 textures and these custom cliffs are just molded ground. Its not like some of the better fps engines (UE3, Crytech, etc) where you can actually mold a cliff and it be a cliff. So yeah its nice that the editor is easy to use but the limitations of it are like early 2000's bad.